Next year, Salesforce.com will release a cloud-based database product called database.com. Salesforce.com took another step toward becoming much more than a CRM company today with the announcement that it plans to release a cloud-based database in 2011. Database.com is built upon Salesforce.com's existing infrastructure and is currently what the company relies on to run its own applications, said Eric Stahl, senior director of product marketing at Salesforce.com. "All the things people know and love about Salesforce applications can be applied to cloud databases," he said. "Just like with applications and platforms, it’s not about taking a bunch of software you run on premise and hosting it on EC2. It's about a whole new architecture -- scalable for the Internet, auto upgradeable, tuned and backed up." 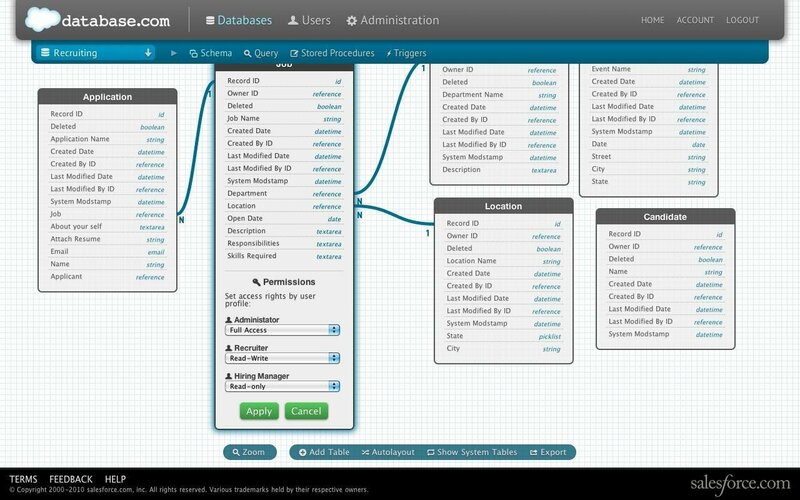 Database.com provides a relational data store built on Salesforce.com's security model; file storage; SOAP and REST APIs to allow developer access; a pre-built "social data model" for feeds, user profiles, status updates and a following model; row-level security; enterprise search; a developer/admin console and extract, transform and load tools. Database.com is also open, allowing developers to write applications in any language, ranging from C# to Java to Ruby to PHP, Stahl said. Applications can also run anywhere -- on Force.com, VMforce, Amazon EC2, Microsoft Azure or Heroku. "A use case that we've been [testing] this with for a bunch of customers is building apps natively on the iPhone or the iPad or Android or Blackberry," Stahl said. "The app runs on your device but can make secure connections to a database in the cloud." Salesforce.com does not expect customers to suddenly move existing Oracle, IBM or Microsoft databases to the cloud but rather to use Database.com for new development projects, Stahl said. In fact, Saelsforce.com itself runs on Oracle databases. "It's really the same underlying infrastructure," Stahl said. "We're pulling out our database and productizing it. There are Oracle databases underneath the covers. It's one of dozens of servers, storage, load balancers and caching products. Oracle's a single tenant piece of database software and we use it in some places. Database.com is a much more abstract offering." For companies that do want to migrate existing databases, Salesforce.com provides the ETL tool and is partnering with Informatica, which offers a tool to take a snapshot of an existing Oracle database and re-create it in Database.com. "I think that works in a straightforward scenario, but if you're using every bell and whistle of Oracle it won't be that simple," Stahl said. Salesforce.com has been building beyond CRM in recent years, developing its own programming language with Apex, a platform for applications with Force.com, VMforce, a Java development Platform as a Service (PaaS) launched with VMware and most recently Chatter, a collaboration platform. "What [Database.com] does is add another layer to the platform as a service building blocks they started with Force.com and extended with Chatter," said Jeff Kaplan, managing director of Wellesley, Mass.-based THINKstrategies. "In part, it's because the line of demarcation between software applications and the database infrastructure it relies on and utilizes is becoming more and more blurred." However, Database.com represents a cleaner separation from Salesforce.com's core CRM product. While Chatter and Force.com were initially shown off using Salesforce.com data, roles and use cases, the Database.com demonstration made no use of the CRM application. "We want people to consider Database.com as a general piece of infrastructure they can use with any app," Stahl said. "We want people to build HR apps and finance apps, any app." Database.com's openness to multiple languages and cloud environments represents a shift in Salesforce.com's early efforts with Apex, its own Java-based proprietary code it had to open up by partnering with VMware, Kaplan added. It should also help fend off Microsoft and its Azure cloud offering. "This is another step in the evolving battle between the two of them and fends off any incursion from the Oracle side," Kaplan said. "It will be a competitive force when looking at Google or Amazon." Salesforce.com said that anyone using database.com will have the option to start a database for free with 10,000 records and 50,000 transactions. Each additional 150,000 transactions and 100,000 records will be priced at $10 per month. Database.com will also offer Enterprise Services for $10 per month each, including identity authentication and row-level security access control.